১৯৬১ চনৰ ১২ এপ্ৰিল তাৰিখত 'ভস্তক ৩কেএ-৩' (ভস্তক-১)-ত কৰা মহাকাশ ভ্ৰমণেৰে গেগেৰিন মহাকাশলৈ যোৱা প্ৰথম মানুহ বুলি পৰিগণিত হয়, লগতে পৃথিৱী পৰিভ্ৰমণ কৰা প্ৰথমজন ব্যক্তি হিচাপেও চিহ্নিত হয়। তেখেতৰ সাংকেতিক চিন আছিল 'কেডাৰ' (Kedr (Cedar, ৰুছ: Кедр). ↑ Hanbury-Tenison, Robin, ed (2010). The Great Explorers. প্ৰকাশক London: Thames & Hudson. পৃষ্ঠা. 270. ISBN 978-0-500-25169-0. ↑ 2.0 2.1 Tito, Dennis (13 November 2006). "Yuri Gagarin". Time Europe via Time.com. Archived from the original on 26 March 2008. http://web.archive.org/web/20080326180036/http://www.time.com/time/europe/hero2006/gagarin.html. ↑ 3.0 3.1 3.2 3.3 3.4 3.5 Rodgers, Paul (3 April 2011). "Yuri Gagarin: The man who fell to Earth". The Independent. Archived from the original on 4 April 2011. http://www.independent.co.uk/news/science/yuri-gagarin-the-man-who-fell-to-earth-2257505.html. ↑ 4.0 4.1 4.2 Moskvitch, Katia (3 April 2011). "Yuri Gagarin's Klushino: Forgotten home of space legend". BBC News. http://www.bbc.co.uk/news/science-environment-12875848। আহৰণ কৰা হৈছে: 4 April 2011. ↑ 5.0 5.1 5.2 5.3 5.4 5.5 5.6 Bizony, Piers (14 March 2011). "First man of Space – the flight and plight of Yuri Gagarin". Engineering & Technology খণ্ড 6 (3). Archived from the original on 26 March 2013. http://eandt.theiet.org/magazine/2011/03/yuri-gagarin.cfm. ↑ "Yuri Gagarin Killed As Test Plane Falls". New York Times. 1968-03-28. http://www.nytimes.com/learning/general/onthisday/bday/0309.html। আহৰণ কৰা হৈছে: 2013-08-31. ↑ 7.0 7.1 7.2 7.3 "Yury Gagarin: Biography". RIA Novosti. 30 March 2011. Archived from the original on 23 May 2012. http://en.rian.ru/science/20110330/163289008.html. ↑ 8.0 8.1 8.2 8.3 Rincon, Paul; Moskvitch, Katia (4 April 2011). "Profile: Yuri Gagarin". BBC News. Archived from the original on 22 January 2013. http://www.bbc.co.uk/news/science-environment-12460720. ↑ 9.0 9.1 Rosenberg, Jennifer. "Yuri Gagarin: The First Man in Space". About.com. http://history1900s.about.com/od/1960s/a/yurigagarin.htm। আহৰণ কৰা হৈছে: 26 March 2013. ↑ 10.0 10.1 ৰুছ "Юрий Алексеевич Гагарин". Astronaut.ru. 11 July 2007. http://www.astronaut.ru/as_rusia/vvs/text/gagarin.htm। আহৰণ কৰা হৈছে: 30 March 2008. ↑ Louis, Victor E; Louis, Jennifer M (1980). Sport in the Soviet Union. প্ৰকাশক Oxford: Pergamon. পৃষ্ঠা. 43. ISBN 0-08-024506-4. ↑ Quoted in Siddiqi 2000, p. 278. ↑ ৰুছ Гагарин, Юрий (3 December 2004). "Дорога в космос". Pravda via TestPilot.ru. http://epizodsspace.testpilot.ru/bibl/gagarin/doroga/obl.html। আহৰণ কৰা হৈছে: 30 March 2008. ↑ "Motherland Hears (download)". SovMusic.ru. http://www.sovmusic.ru/english/download.php?fname=rodinasl। আহৰণ কৰা হৈছে: 30 March 2008. ↑ "Motherland Hears (lyrics)". SovMusic.ru. http://www.sovmusic.ru/english/text.php?fname=rodinasl। আহৰণ কৰা হৈছে: 30 March 2008. ↑ ৰুছ "Полная стенограмма переговоров Юрия Гагарина с Землей с момента его посадки в корабль (за два часа до старта) до выхода корабля "Востока-1" из зоны радиоприема". Cosmoworld.ru. http://www.cosmoworld.ru/spaceencyclopedia/gagarin/index.shtml?doc10.html। আহৰণ কৰা হৈছে: 30 March 2008. ↑ "I am proud to be accused of having introduced Yury Gagarin to Orthodoxy". Interfax-religion.com. 12 April 2006. Archived from the original on 21 May 2013. http://www.interfax-religion.com/?act=interview&div=24। আহৰণ কৰা হৈছে: 30 March 2008. ↑ "Gagarin's family celebrated Easter and Christmas, Korolev used to pray and confess". Interfax-religion.com. 11 April 2011. Archived from the original on 21 May 2013. http://www.interfax-religion.com/?act=news&div=8361. ↑ ৰুছ "На орбите дружбы". МК в Египте. 24 April 2011. http://mkegypt.net/etobilonedavno/308--11. ↑ Callow, John (17 January 2009). "Yuri Gagarin in Manchester". WCML.org.uk. http://www.wcml.org.uk/contents/international/cold-war/yuri-gagarin-in-manchester/। আহৰণ কৰা হৈছে: 12 April 2010. ↑ 26.0 26.1 26.2 French, Francis (July 1998). "Yuri Gagarin's Visit to Manchester". Spaceflight (British Interplanetary Society) খণ্ড 40 (7). http://yurigagarin50.org/history/gagarin-in-britain/gagarin-in-manchester। আহৰণ কৰা হৈছে: 7 March 2011. ↑ Krulwich, Robert (18 March 2011). "Cosmonaut Crashed Into Earth 'Crying In Rage'". Krulwich Wonders via NPR.org. http://www.npr.org/blogs/krulwich/2011/03/23/134597833/cosmonaut-crashed-into-earth-crying-in-rage। আহৰণ কৰা হৈছে: 12 April 2011. ↑ 28.0 28.1 Abel, Allen (May 2011). "The Family He Left Behind". Air & Space. http://www.airspacemag.com/space-exploration/The-Family-He-Left-Behind.html?story=fullstory। আহৰণ কৰা হৈছে: 26 March 2013. ↑ "Gagarin in his daughter's words". Euronews.net. 12 April 2011. http://www.euronews.net/2011/04/12/gagarin-in-his-daughter-s-words/। আহৰণ কৰা হৈছে: 27 April 2012. ↑ ৰুছ "Праздничные мероприятия, посвященные 50-летию полета Ю.А. Гагарина в космос". Rea.ru. 11 April 2011. http://www.rea.ru/Main.aspx?page=REA_NEWS&NewsItem=2975। আহৰণ কৰা হৈছে: 27 April 2012. ↑ Aris, Ben (28 March 2008). "KGB held ground staff to blame for Gagarin's death". The Daily Telegraph. http://www.telegraph.co.uk/news/worldnews/europe/russia/1425937/KGB-held-ground-staff-to-blame-for-Gagarin%27s-death.html। আহৰণ কৰা হৈছে: 1 August 2008. ↑ Holt, Ed (3 April 2005). "Inquiry promises to solve Gagarin death riddle". Scotland on Sunday. http://scotlandonsunday.scotsman.com/world/Inquiry-promises-to-solve-Gagarin.2615429.jp। আহৰণ কৰা হৈছে: 30 March 2008. ↑ Osborn, Andrew (September 2010). "What Made Yuri Fall?". Air & Space. http://www.airspacemag.com/space-exploration/What-Made-Yuri-Fall.html। আহৰণ কৰা হৈছে: 24 September 2010. ↑ Osborn, Andrew (12 April 2007). "Kremlin vetoes new inquiry into mystery death of Yuri Gagarin". The Belfast Telegraph. Archived from the original on 14 January 2013. http://archive.is/NQGww। আহৰণ কৰা হৈছে: 30 March 2008. ↑ Malpas, Anna (8 April 2011). "Russia sheds light on Gagarin death mystery". AFP. Archived from the original on 26 March 2013. http://www.google.com/hostednews/afp/article/ALeqM5iyJUQulpBwoJk3rHAiK7mNM73eRw?docId=CNG.a9a3bd2a391cf386442c29b6c7f67b99.3b1। আহৰণ কৰা হৈছে: 8 April 2011. ↑ Leonov, Alexei; Scott, David (2004). Two Sides of the Moon. প্ৰকাশক New York: Thomas Dunne Books. পৃষ্ঠা. 218. ISBN 0-312-30865-5. OCLC 56587777. ↑ "Death of Yuri Gagarin demystified 40 years on". RT.com. 14 June 2013. Archived from the original on 15 June 2013. http://archive.is/VMFBe. ↑ Major, Jason (14 June 2013). "Details of Yuri Gagarin's Tragic Death Revealed". Universe Today. http://www.universetoday.com/102934/details-of-yuri-gagarins-tragic-death-revealed/। আহৰণ কৰা হৈছে: 17 June 2013. ↑ Williams, Huw (7 March 2011). "Memories sought of Yuri Gagarin's way into space". BBC News. http://www.bbc.co.uk/news/uk-scotland-edinburgh-east-fife-12661377। আহৰণ কৰা হৈছে: 11 April 2011. ↑ McKie, Robin (13 March 2011). "Sergei Korolev: the rocket genius behind Yuri Gagarin". The Guardian. http://www.guardian.co.uk/science/2011/mar/13/yuri-gagarin-first-space-korolev। আহৰণ কৰা হৈছে: 11 April 2011. ↑ "Yuri Gagarin Featured on Russian Gold and Silver Coins". Coin Update. 14 April 2011. http://news.coinupdate.com/yuri-gagarin-featured-on-russian-gold-and-silver-coins-0772/. ↑ Fraser, Adam (19 May 2010). "UFA Sports to market Kontinental Hockey League". SportsPro Media. http://www.sportspromedia.com/news/ufa_sports_to_market_kontinental_hockey_league/। আহৰণ কৰা হৈছে: 19 August 2010. ↑ "Space Foundation Survey Reveals Broad Range of Space Heroes". Space Foundation. 27 October 2010. http://www.spacefoundation.org/news/story.php?id=1038। আহৰণ কৰা হৈছে: 17 January 2011. ↑ Kaminski-Morrow, David (15 January 2011). "Picture: First Armavia Superjet awaits delivery". FlightGlobal.com. http://www.flightglobal.com/articles/2011/01/15/351904/picture-first-armavia-superjet-awaits-delivery.html। আহৰণ কৰা হৈছে: 17 January 2011. ↑ Parfitt, Tom (6 April 2011). "How Yuri Gagarin's historic flight was nearly grounded". The Guardian. http://www.guardian.co.uk/science/2011/apr/06/yuri-gagarin-orbital-flight-1961। আহৰণ কৰা হৈছে: 7 April 2011. ↑ Riley, Christopher (11 April 2011). "What Yuri Gagarin saw: First Orbit film to reveal the view from Vostok 1". The Guardian. http://www.guardian.co.uk/science/blog/2011/apr/11/yuri-gagarin-first-orbit-vostok। আহৰণ কৰা হৈছে: 12 April 2011. ↑ Anikeev, Alexander (29 April 2011). "Spacecraft "Soyuz-TMA21"". Manned Aeronautics. http://space.kursknet.ru/cosmos/english/machines/stma21.sht। আহৰণ কৰা হৈছে: 1 May 2011. ↑ Hoffmann, Bruno. "Para Yuri Gagarin, Brasília era um planeta diferente [For Yuri Gagarin, Brasil was a different planet]". Brasil Almanaque de Cultura Popular. http://www.almanaquebrasil.com.br/curiosidades-historia/6522-para-yuri-gagarin-brasilia-era-um-planeta-diferente.html। আহৰণ কৰা হৈছে: 26 September 2009. Bassin, Mark; Kelly, Catriona, eds (2012). Soviet and Post-Soviet Identities. প্ৰকাশক Cambridge: Cambridge University Press. পৃষ্ঠা. 140–141. ISBN 1107011175. http://books.google.com/books?id=2f4pSA4S8UwC&pg=PA140. Gavrilin, Vyacheslav Mikhailovich (1973). Sportsmen of the Soviet Army. প্ৰকাশক Moscow: Novosti Press Agency. OCLC 23374154. Siddiqi, Asif A (2000). Challenge to Apollo: The Soviet Union and the Space Race, 1945–1974. প্ৰকাশক Washington, D.C.: NASA. SP-2000-4408. OCLC 48909645. Part 1 (page 1-500), Part 2 (page 501-1011). Cole, Michael D (1995). 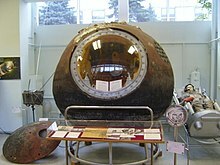 Vostok 1: First Human in Space. প্ৰকাশক Springfield, NJ: Enslow. ISBN 0-89490-541-4. Doran, Jamie; Bizony, Piers (1998). Starman: The Truth Behind the Legend of Yuri Gagarin. প্ৰকাশক London: Bloomsbury. ISBN 0-7475-4267-8. Photo, Audio and Video with Yuri Gagarin, online version of CD created to his 70th anniv. on the homepage of Russian state archive for scientific-technical documentation (RGANTD). Article in online Encyclopedia of cosmonautics A lot of information about the first human's flight to space.